(by Anne Marie Chaker, The Wall Street Journal) – Countless kitchen squabbles go something like this: Someone looks at the date on the lettuce and thinks it has gone bad. The other person says it is perfectly fine. So who is right? In the U.S., about 30% to 40% of all food is wasted, or about $161 billion worth of food, according to Agriculture Department estimates. While it is unclear how much of that is due to consumers misreading date labels, a recent survey of over 1,000 grocery shoppers by the Food Marketing Institute, a trade association for grocery stores, showed that nearly half of consumers said they threw out food either “fairly often” or “every time” after the sell-by or best-by date. Yet, terms such as sell-by, use-by and best-before don’t indicate the safety of food, as many people believe. The dates are typically set by the manufacturer to indicate when food is at its peak quality. Still, many consumers believe that not sticking to those dates could make them sick. Most products are still safe to eat after the dates listed on the packaging. There is little federal regulation. Some states regulate date labeling on certain foods, such as milk or eggs. In other cases, consumers rely on manufacturer-provided date codes. And sometimes, it is anybody’s guess. For detailed recommendations on what’s safe to eat when, see “Background” below the questions. Throwing away food can make people feel guilty, and much of the reason why is rooted in the way we grew up. Some households are likelier to toss food while others are more economical. Further confusing consumers, the food-dating language varies by which audience it is intended for. The sell-by date is primarily meant for retailers to control stock. A best-by or use-by date is the manufacturer’s recommendation of the last day when a product can be eaten at peak quality. A freeze-by date indicates that a food’s quality can be stretched longer when freezing by that date. At the National Food Lab in Livermore, Calif., 45 trained “sensory” panelists test foods for manufacturers by rating and describing the “aroma, flavor, texture and mouth feel” over time and at different temperatures, says Jena Roberts, vice president of business development for the company, which performs shelf-life studies for food manufacturers. After one or two years of testing, the results turn into a recommendation of what is peak quality, when it occurs, and what the shelf life should be, Ms. Roberts says. Such testing helped the California Walnut Board, which represents walnut processors, prove that storing walnuts in the refrigerator kept them fresher longer than at room temperature. In a study begun in March 2013, walnuts only lasted 8 months when stored at 70 degrees Fahrenheit or warmer before they started to get a “rancid, turpentine smell,” says Carl Eidsath,technical support director. But the 66-week study showed that refrigerated walnuts still tasted fresh after a year. Almonds can last for two years if stored in similar cool and dry conditions, according to the Almond Board of California. The main reason food products can make people sick with food poisoning isn’t their age, but whether a bacterial contaminant—like certain types of listeria or salmonella—has entered the food. Someone might find the scent or taste of old food gross, but that is different from causing food-borne illness. Food under certain conditions may be more susceptible to contamination or bacterial growth. If food has been poorly refrigerated (over 40 degrees Fahrenheit) or if there was a hole in the packaging, certain bacteria could come into contact, seep in and multiply over time. Food consultants say that people throw out more food when safety concerns are heightened. “In the context of food safety recalls, people are more afraid of their food than they probably have been in previous generations,” says Kara Nielsen, culinary director at Sterling-Rice Group, a Boulder, Colo., consulting firm. 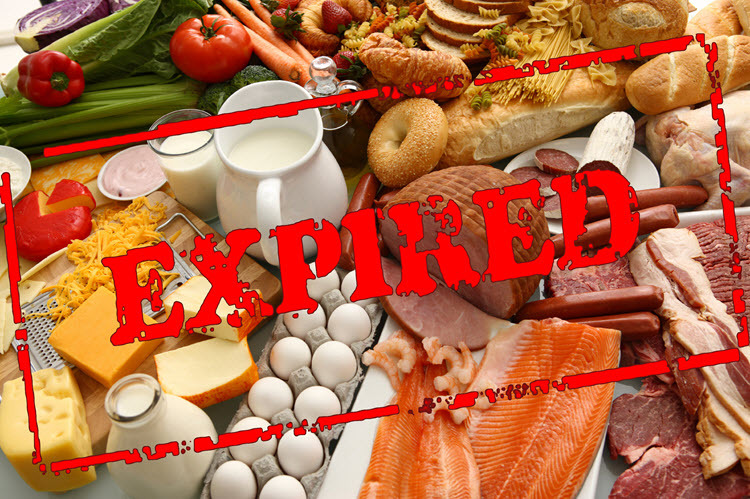 In Cambridge, Mass., Mahalia Cole recently noticed expired food containers in boyfriend David E. White Jr.’s pantry and refrigerator, including opened cocktail sauce and strawberry jam. “I took out things that were a year expired,” says the 30-year old attorney, and left them on the kitchen table. It was intended as a subtle hint. “He could decide,” she says. Bi-Rite Market in San Francisco has a program to minimize food waste. Staffers are encouraged to talk with shoppers, asking them what they are making for dinner and for how many people. The resulting guidance might be, “you only need this much meat or that much kale to do that,” says Shakirah Simley, community programs manager. Published December 8, 2015 at The Wall Street Journal. Reprinted here Dec. 10, 2015 for educational purposes only. Visit the website at wsj .com. 1. The purpose of an editorial/commentary is to explain, persuade, warn, criticize, entertain, praise or answer. What do you think is the purpose of Anne Marie Chaker’s editorial? Explain your answer. Eggs — Egg cartons typically have a three digit code that indicates the date of packaging starting with January 1 as 001 and ending with December 31 as 365. Some retailers request sell-by or use-by dates for a month to 45 days after the pack date, says Ken Anderson, a professor of poultry science at North Carolina State University. Eggs are edible for at least 12 weeks, he says. Milk — If stored at 40 degrees or below, a carton of milk should last five to seven days after being opened before signs of spoilage start to occur, says Cary Frye, vice president of regulatory and scientific affairs for the International Dairy Foods Association. As bacteria multiply, a sour smell or a bitter taste can develop, but it won’t necessarily make you sick, she says. Bread — Refrigeration will delay bread going moldy, but it may become stale through starch retrogradation, or the crystallization of starch molecules. Bread at room temperature will stay softer, but could grow mold in a few days depending on the bread’s moisture content and added preservatives, says Donald Schaffner, a food science professor at Rutgers University. Canned goods — While canned goods should remain safe indefinitely, says Dr. Schaffner, consumers should be aware that the information in the nutrition label won’t necessarily remain accurate. “So the advice we give people for canned goods is to keep them not more than two years,” he says. Packaged greens — Packages of broccoli, carrots and celery may not look as perky after the sell-by or use-by date, but that doesn’t mean they can’t be put in soups and stews. Somewhat wilted veggies can work well sauteed in oil and butter as well.